As Abraham Lincoln stated, "In the end, it's not the years in your life that count. It's the life in your years." Although we lost him at just 23, our beloved Johnny knew the meaning of life. Johnny's feats gained him recognition at a very young age. At age 12 he climbed his first world-class peak, Mt. Vinson Massif in Antarctica. This began his journey towards climbing all seven of the world's highest peaks, a goal which he achieved at the young age of 17. This feat put him in the record books as the youngest person to successfully summit the highest peaks on all seven continents. Since then, he's gone on countless adventures all over the globe. For Johnny Strange, adventure was his life. Whether base jumping into the Grand Canyon, surfing 30 foot waves in Hawaii or skateboarding down the side of a mountain, Johnny Strange was a man who exemplified courage, strength and excitement. What really defined him was living with purpose. Everything he did was dedicated to helping raise awareness about Parkinson's disease and bringing an end to genocide. Johnny Strange was an adventurer and humanitarian with a huge heart and a smile to match. On October 1, 2015 we lost our friend and inspiration. Johnny crashed while flying in a wing-suit in the Swiss Alps. We also lost an irrepressible advocate for finding the cure for Parkinson's disease. 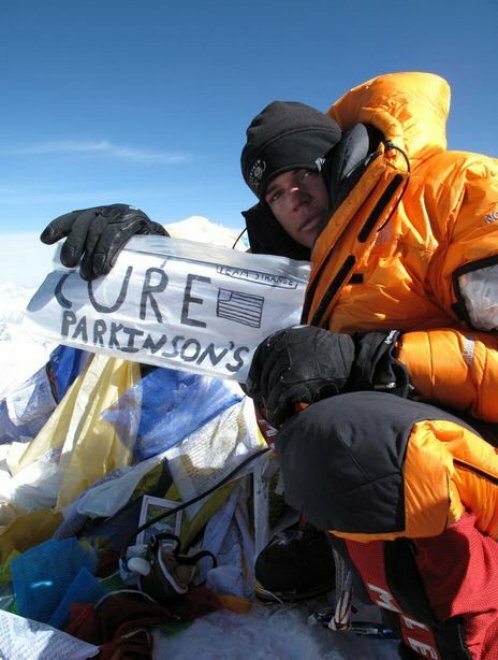 At the summit of Mount Everest, Johnny unfurled a homemade flag declaring "Cure Parkinson's" informing the world that he climbed to raise awareness and drive the cure. He implored everyone to donate. "When I get tired, I simply take a break. I sit down, stop climbing, working out, whatever. 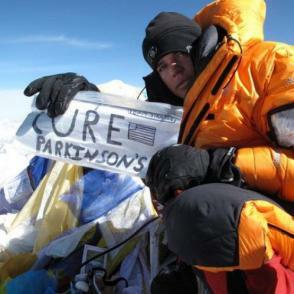 Those who suffer from Parkinson's disease climb every moment of every day. They simply do not have the luxury of taking a break. Their struggle is 24/7. If I was able to motivate everyone to donate we would make a huge difference in the fight against Parkinson's." Johnny would also say that "impossible is nothing." He believed that a cure was possible if we all dared to dream. Never concerned with the amount contributed, Johnny was focused on having as many people as possible join in his passions and give. In loving memory of Johnny and his unyielding advocacy efforts, please make his dream live on and contribute for the cure. "The day I let my fear deter my ability to follow my dreams, I have already died," "I will, as well as everyone else die someday, but on this day, I was more alive than I had ever been before." The Michael J. Fox Foundation is dedicated to finding a cure for Parkinson's disease and to ensuring the development of improved therapies for those living with Parkinson's today. The Foundation is the world's largest nonprofit funder of Parkinson's research, with more than $800 million in high-impact research funded to date.